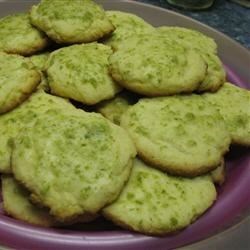 "Lime flavored and glazed cornmeal cookies Use lemon extract if you can't find lime." Beat the butter and 2/3 cup sugar together until creamy. Mix in the egg and lime extract. Blend well. In a separate bowl, combine the cornmeal, baking powder, salt and flour. Add the flour mixture to the butter mixture and mix well. Drop teaspoonfuls of the dough onto the prepared baking sheets. Dip the bottom of a glass, or similar round, flat object in the 1/4 cup sugar, and slightly flatten the balls of dough. Bake at 375 degrees F (190 degrees C) for 10 to 12 minutes or until cookie bottoms are lightly browned. To Make Icing: Combine the lime zest, confectioners' sugar, and enough lime juice to make a spreadable glaze. Spread over the tops of cooled cookies. These cookies are appropriate for tea. They break somewhat easily but are worth the effort. One of the best cookies I've had. Fantastic- no changes except I added a few choc chips for kidsake to a few of them and still yummy. For the glaze, I grated lime zest to add color.